The engineered world is full of systems. From the simple water heater to the fully integrated international airport, from ancient irrigation systems to modern communication networks, all systems share one key feature: their elements together produce results not obtainable by the same elements alone. These elements, or parts, can include people, processes, information, organisations and services, as well as software, hardware and other systems. The layout of the system, defining all the elements and their interconnections, needs to be carefully considered to ensure that each element on its own and in combination with others performs as required. In response to this challenge and the ever increasing complexity of modern systems, a new discipline of systems engineering has evolved as an interdisciplinary approach to enable the realisation of successful systems. Systems engineering focuses on defining stakeholder needs and required functionality early in the development cycle, documenting requirements, then proceeding with design synthesis and system validation while considering the complete problem. It integrates all the necessary disciplines and specialty groups into a team responsible for using a structured development process that proceeds from needs to requirements to concepts, and from design to production to operation, addressing all the stakeholders’ business and technical needs (Figure 19). 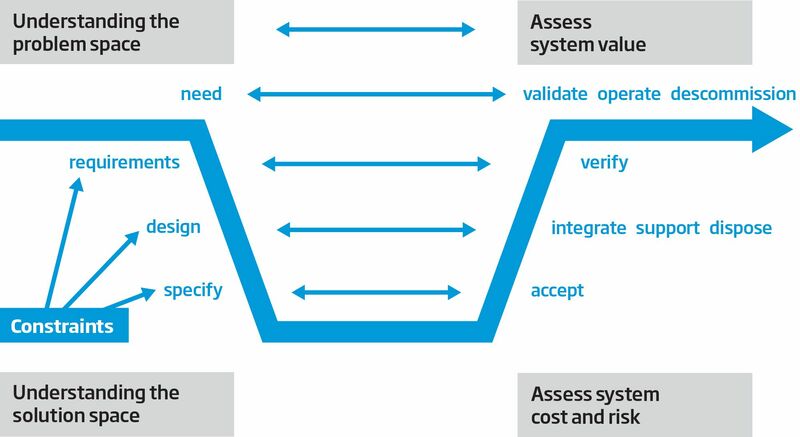 The systems engineering V-Model (INCOSE UK Z-Guides)  provides a succinct description of an engineering systems approach. It not only makes specific reference to systems, design and risk thinking activities, but also provides implicit reference to the need for and value of people-centric activities. A successful system delivery process brings together technical specialists and system architects to ensure a holistic system perspective is maintained throughout; not only in terms of the overall layout of the system and its elements, but also with regard to the whole system lifecycle. Some will provide a focus on individual elements and their role in the system, others will take a holistic view of the system and its performance. Both will play a part in defining the boundary of the system, its requirements, the partitioning of its elements and interfaces, its integration and evaluation, and ultimately its release into service. Typically, different and yet coherent perspectives of the system are developed and held by different teams and stakeholders. Consider a house that is made up of a number of systems that co-exist to ensure that a house becomes a home (Figure 20). 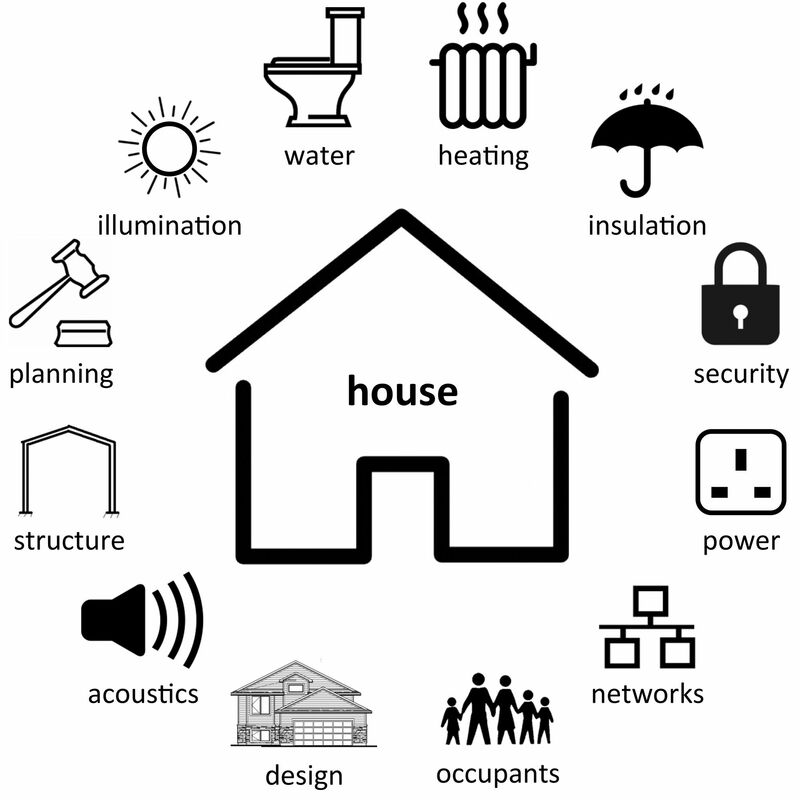 Some are discrete yet interconnected (water, heating, power, security and networks) while others are naturally more holistic (design, structure, planning, illumination and insulation). A typical house relies on a number of interrelated systems to provide a safe, functional environment for its occupants. The layout and exterior design rely on a sound structure and deliver should appropriate thermal and acoustic behaviour. Water, heating, power, security and networking all add to the home experience. The delivery of any particular system requires expert knowledge of that system and how it will interface to the whole. The heating specialist cannot develop an appropriate solution without knowledge of the design, structure and insulation, nor can they deliver the solution without detail of the power and water systems. Each specialist will have a different perspective on the house, yet architects, and subsequently builders, act as system integrators, delivering homes with emergent properties greater than the sum of the individual parts. For example, the energy rating of a house depends on a combination of design, structure, insulation and heating, while its desirability may depend on these and many more factors. A good house design is critically dependent not only on its architectural properties but also on engineers systematically evaluating its performance. Structural engineers model the resilience of the house under all expected loads, insulation specialists model its thermal properties and heating engineers size their systems based on these results and the likely behaviour of its occupants. Utility providers model the water, waste and power requirements, particularly where multiple houses are being built. Local authorities model the impact of new homes on the environment and on local services such as schools, hospitals, highways and waste collection. Governments model the demand for new homes based on expected patterns of migration. As a result, the house may be seen as an element in an extended system of systems. Satellite navigation systems extend far beyond the ‘satnav’ found in many cars. They rely on the GPS operators for positional information via an array of satellites, navigation service providers for up-to-date maps, traffic data integrators for current traffic information and mobile operators for real-time communication. Engineered systems often rely for their operation on a number of independent, but interrelated systems. 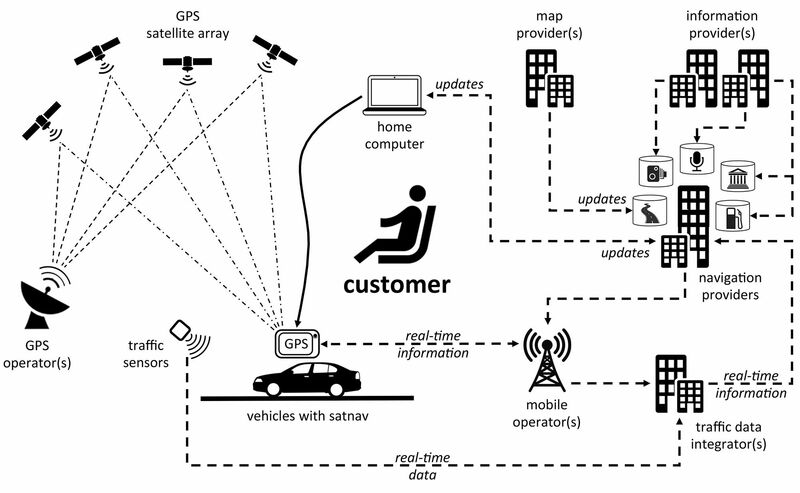 For example, a satellite navigation system depends on the action and operation of a number of service providers (Figure 21). The degradation of any one of these systems or the interfaces between them will have an adverse impact on the navigation experience and possibly the safety of the vehicle occupants. Further systems, such as rocket launch vehicles, mapping technologies and voice recording studios, are also required to enable the successful deployment of a navigation system. Inevitably, the focus of individual development teams for these systems would have been different, particularly since GPS satellite arrays and mobile telecommunication systems were not initially designed with commercial navigation systems in mind. However, the architects of ‘satnav’ systems would have had a holistic vision for their system of systems and robust descriptions of the interfaces relevant to the individual elements and to the whole. Systems are designed at many levels of scale from the micro to the macro, where they often involve complex interactions between people, physical infrastructure and technology. This is exemplified by the London 2012 Olympic and Paralympic Games: 205 competing nations, 17,000 athletes and officials, 26 different sports, covered by 22,000 journalists and over 10 million tickets to be sold. An Act of Parliament established the Olympic Delivery Authority (ODA) with a budget of £8 billion to deliver the infrastructure, venues, athletes’ village and transport, all to time and budget, in a sustainable manner and to leave a lasting legacy. The ODA commissioned a delivery partner to manage the construction of the Olympic Park in East London and to manage the complex logistics on the site. Both were similarly incentivised to ensure an alignment of objectives between the two teams to deliver a programme over six phases: Plan, Demolish, Build, Test, Games and Legacy. Their common purpose was to deliver the best Games ever and a lasting legacy for London. 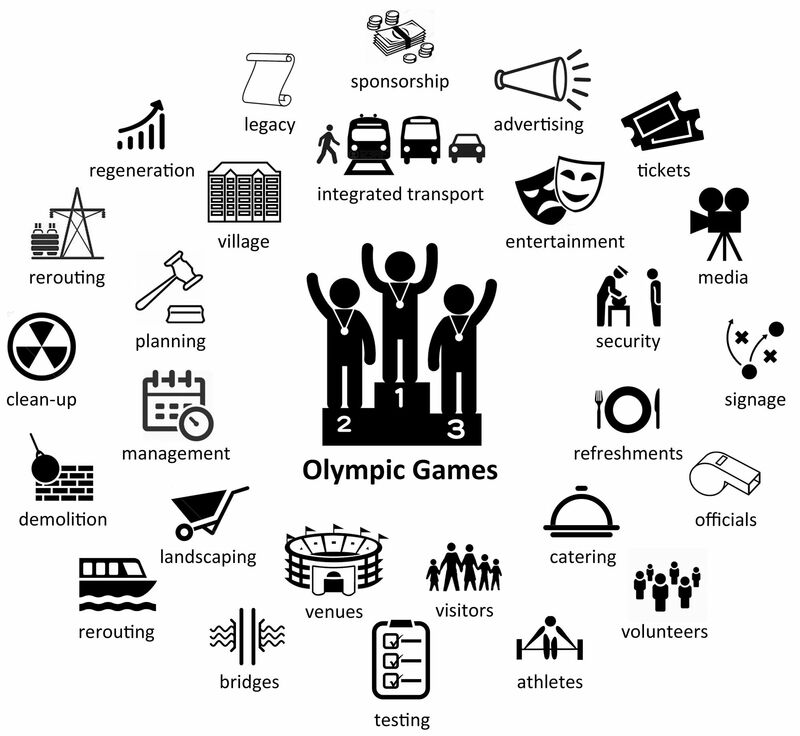 A number of interrelated elements were developed relating not only to the physical infrastructure required, but also to the practical organisation of the Games (Figure 22). The 2012 Olympic and Paralympic Games provided an opportunity for London to deliver the best Games ever, but to do so required the delivery of not only the Games’ distributed physical infrastructure (challenges on the left), but also the systems required to organise the single largest peacetime event in the world (on the right). The success of the Games and its legacy was critically dependent on early decisions relating to the Olympic Park, a challenging site that needed significant redevelopment. Both the immediate and future needs were realised through the provision of temporary or reconfigurable sports venues, removable bridges alongside permanent structures and landscaping for the longer term. Innovative engineering delivered world-class, cost-effective buildings. Modelling and simulation of people flows informed provision of signage, refreshments, security, helpers, transport and information for visitors. Testing of new venues identified problems early, leading to better provision for athletes, officials and visitors. The opening ceremony saw the choreographed actions of thousands of volunteers, athletes and officials broadcast live to more than 900 million people worldwide. Extensive planning and risk management by the engineering-led team made the complex merely complicated. A systems approach, combined with tried and tested engineering methods and tools, delivered real success on a massive scale. Systems engineering enables the co-development of the individual components of a system through the rigorous definition of the whole and individual system requirements, careful design and integration of the parts, and sustained evaluation and improvement of the system performance. Further information on this topic can be obtained from the INCOSE UK Chapter. Creating systems that work: Principles of engineering systems for the 21st century, Royal Academy of Engineering, 2007. INCOSE (International Council on Systems Engineering) UK Z-Guide 1: What is Systems Engineering, INCOSE UK, 2009. Engineering the Olympics: The 2011 Lloyd’s Register Educational Trust Lecture, Royal Academy of Engineering, 2001.